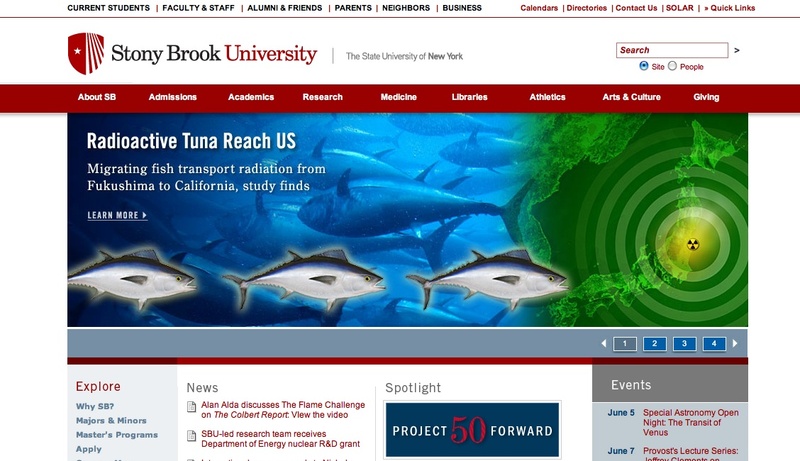 The actual press release from Stony Brook makes it clear that there is no health risk posed by these tuna, but it’s buried behind a picture of a line of tuna swimming into a radioactive bullseye over a glowing-green Japan. Contrast this with Stanford’s slightly more restrained press release, which emphasizes that the radioactivity is very low-level. Not sure that there’s a larger lesson to be drawn here, other than that it’s another example of the science news cycle. My favorite piece so far on this story is from Carl Safina, the scientist / conservationist / writer and Stony Brook affiliate. He wrote a column in HuffPo on Saturday, where he pointed out that mercury and overfishing are far bigger problems for people and bluefin than radiation. Read that one here. This entry was posted in Uncategorized and tagged bluefin tuna, Fukushima Daichi, news, radioactivity, Stanford University, Stony Brook University. Bookmark the permalink.